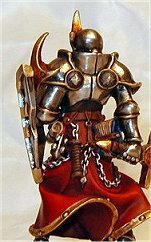 If you’re not an adept of NMM, SENMM, and others and if you’re not satisfied with metallic paints, you may try polish your mini. With this technique you can obtain very reflective armors or swords, and you don’t have to paint the reflects We have the chance to paint 3D objects, so I think we can use this advantage to obtain real reflects! 1-Polish the parts you want to look metallic with extra-fine steel wool. You can use before the steel wool something more abrasive to get a regular surface, if you don’t want to loose time. 2-If you’re not satisfied with this first two steps and want something really shiny, polish the mini with something like very tender wood (I used matches). This way you can “erase” the micro scratches done by the steel wool and get something very reflective. Don’t do this if tou want a “used”or dirty armor. 3- Now it should really look like a mirror (at least with rackham’s mini) and you may start adding shades in the appropriate places. For this I used Tamiya “smoke” X19: this is a kind of colored sealant you can mix down with water and apply very easily on bare metal and wich is very (very!!) resistant. (this thing is magic ) You may apply it even on parts you don’t want to shade (mixed-down with a lot of water) just to protect the metal from abrasion and corrosion. 4-After Tamiya’s smoke is dry, (i.e. a few seconds) you may notice some ugly reflections in the recesses (like between the plates of an armor) due to Tamiya’s being very glossy. To mask them, I simply used mate dark acrylic paint and a very fine brush. You can use Tamiya X-20A acrylic thinner with the “smoke”, this is not necessary but this way it dries very (maybe too) quickly. This product exists in other colors, and maybe colored metal looks good? ?